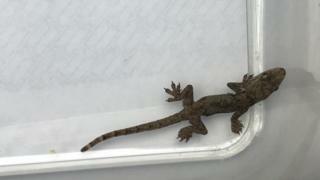 A globe-trotting gecko "hitched a lift" with an unsuspecting holidaymaker, flying 5,500 miles with her back from Sri Lanka to Chester. The woman, who has not been named, found the reptile while unpacking her suitcase on Tuesday, the RSPCA said. She managed to put the gecko in a sandwich box - complete with air holes - before calling the charity. Holidaymakers have been reminded to always check their cases before heading home to avoid "surprising stowaways". RSPCA inspector Leanne Cragg said: "The gecko appears to be unscathed by his long and adventurous journey and is actually pretty lively." The reptile has now been taken in by a specialist keeper since it is unlikely that the gecko would survive the British winter for long. It is an offence under the Wildlife and Countryside Act 1981 to release geckos, or to allow them to escape into the wild.